Very nice resource. 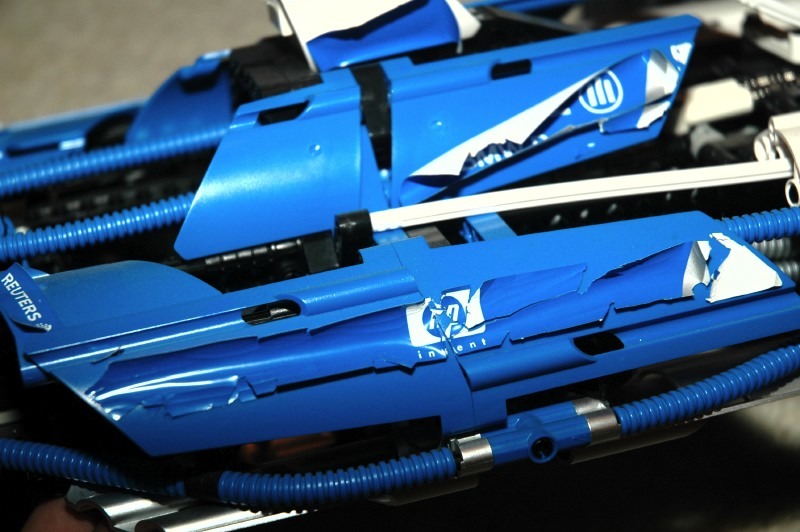 What I really need is the stickers for the Williams F-1 Racer since mine were so thoroughly destroyed. This sticker sheet alone can fetch $75 on Bricklink. The set itself is rare, and due to the poor sticker quality, everyone who has one needs a new sticker sheet. I wish LEGO would release the file used to create these stickers so we could make our own. I have the bmw dealer edition of the Williams F-1 Racer, even rarer, and just happens to have some different stickers... Luckily the stickers are in good nick apart from the rear wing (one of the ones thats different), but i don't stand a chance of ever getting a second set, only way would be to do photograph them and try and clean them up in photoshop, doable but a lot of work. The sticker set for the 8461 Williams F1 Racer (BMW version) are on the last page (129) of the BrickFactory instruction scans http://www.brickfactory.info/set/index.html'>http://www.brickfactory.info/set/index.html . Sometimes the Technic set stickers are scanned and included in BrickFactory's collection. Type in your set number in http://www.brickfactory.info/ , and see. They would probably be on the very last scanned page; press the >> button to zoom to the end. The sticker set for the 8461 Williams F1 Racer (BMW version) are on the last page (129) of the BrickFactory instruction scans http://www.brickfact.../set/index.html . Thanks for this file. I had a scanned version of the sticker sheet at much lower resolution, but this one is far superior. I can't hope to reproduce the silver by printing it, but I may be able to get close. The other issue is color matching. When the stickers are a different color than the model, it doesn't matter much. But with so much blue in the stickers and blue on the model, I'll need to be able to print the color accurately to look good. My real ambition is to take this file and trace over it in a vector editing program like Canvas or Illustrator (though I don't have either of those pieces of software any more). Then it could be printed at scale and be perfect quality. 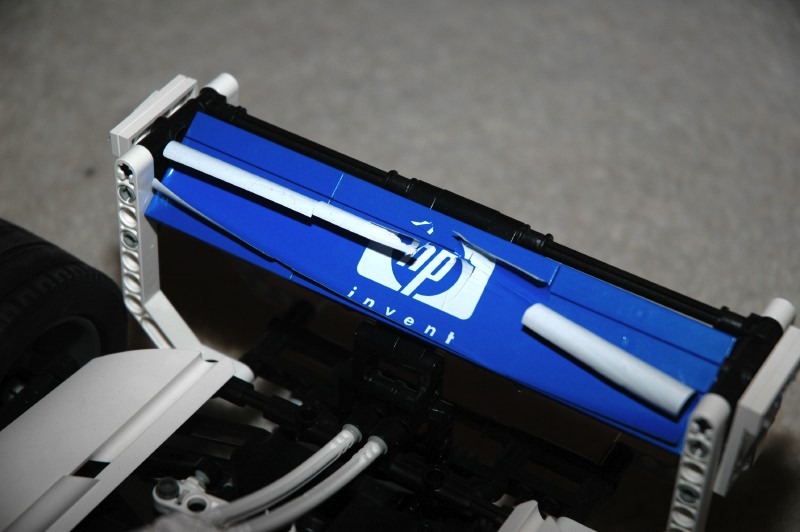 I did find a place to order vinyl stock for inkjet printers, so I may yet give this a try. A couple of my Ferrari racers have similar, but less severe, problems and could also benefit from repair. Same deal with the Silver Champion, but I managed to secure a new sticker set for that. When I put it on, I am going to apply clear coat over the top so they can never peel off again. Out of curiosity, how did you happen upon the dealer edition? As a collector, I am quite interested in any information you can provide about that. Do you have photos? That's exactly what Tony did for several Model Team. TLG really should release the file for people to reproduce all the stickers they want. That wouldn't cost anything to TLG. Interesting. He obviously created a couple in a vector program, but he didn't actually post the vector file. A vector file would be something like a WMF (Windows Metafile), CGM (Computer Graphics Metafile) or one of the proprietary formats from Adobe. He actually posted a very high resolution BMP which is still a raster file, probably exported from whatever software he was using. Resurrecting an old thread, does anyone have luck reproducing the 8461 Lego Williams F1 sticker sheet? On one of my 8043 Excavators, I left it sitting on a desk with a window facing east behind it, but now that the angle of the sun in northern US started to turn and get hotter in the mornings as we get much more daylight now, I was messing with it a couple days ago and I found an unwelcome sight, the stickers facing the window had warped some and now won't stick anymore and I'm not sure how to safely remove the sticker residue without either discoloring the yellow...stupid move..unfortunately I have one of those $30 inkjet printers from Walmart that doesn't have the greatest print quality...wonder if Lego can send me another sticker sheet. 8043 was available recently enough that I'm sure you can get a new sticker sheet from LEGO. They will probably give it to you free, but at the least you could buy it. Of course they are available on Bricklink as well. There is one eBay seller offering repro sheets; he's based in Greece. I don't know what the quality is like, but his feedback is solid & prices seem pretty good. He's got an auction showing scans of 4 sets but says he can do others on request. I don't know if posting a link to him would be frowned on or not & I wouldn't want to annoy anyone, so I'll refrain from doing so. If it's OK with the mods I'll edit this post to include the link. I couldn't find a decent sized scan of the sticker sheet for 8448, so I made one myself. (It's not 100% accurate but it's pretty darn close); I just need to print them out. Does anyone have any recommendations for the right type of sticker material to print these out on? What about the copyright? suppose i have found an online vendor who prints stickers with uploaded image-files (e.g. some of the lego sticker images, posted above)... is this allowed to upload images of lego stickers for the purpose printing a new sticker for only private usage or am i breaching the copyright of lego for these stickers? i don't think they would mind because they are pretty cheap, just paper, ink, and the sticky stuff. @Blakbird- what do you mean its too old an topic to bump? I do see DLuders started this in 2010, but I don't pay attention to dates when the topic was started, I just asked a simple question. And I didn't even get a reply of how to safely remove the sticker residue. Is this a personal attack against me? Additionally, the 8043 was recently available, yes, but all the posts were mainly about printing their own sticker sheets, not necessarily waiting for Lego to get the sheet from overseas, it seems all parts, etc, come from their factory. You know more thing that irks me, I post a topic or ask a question and what do I get, 1 or 2 replies or none at all. Is this some kind of thing against me? Whereas others get a million replies. I enjoy this forum for information, ideas, etc, but it seems every time I post I get ignored or bashed, kind of like some kind of high school clique. @ TechnicFreak: Of course it's nothing "personal" against you. However, I think that (sometimes) you would get more "Replies" to your posts if you shortened them. You tend to type too many paragraphs for people to quickly scan your posts. 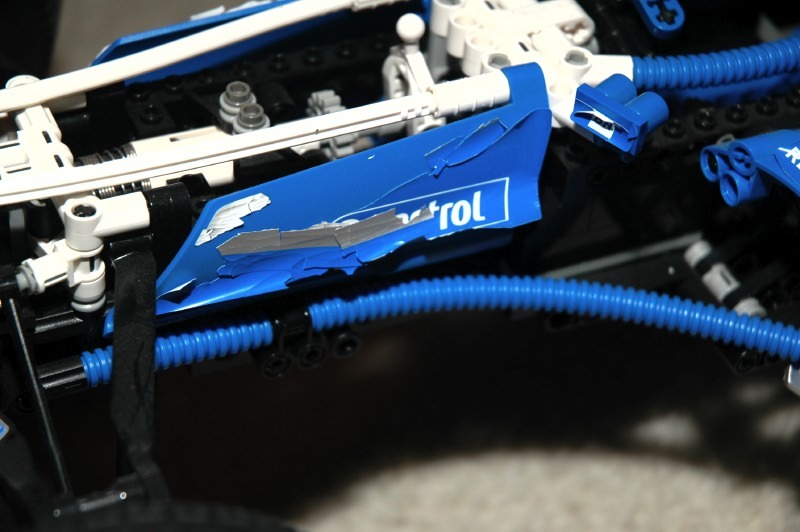 Anyway (getting back on topic), to remove the sticker residue, you could get ideas from this Eurobricks topic. @Blakbird- what do you mean its too old an topic to bump? No worries, TechnicFreak. I have a built-in "netiquette" filter in my brain that goes all the way back to USENET days that says it is bad form to post in a topic that has been inactive for more than a few months. But your post is certainly relevant. Sorry if you felt anything personal was implied. I just asked a simple question. And I didn't even get a reply of how to safely remove the sticker residue. Well, you didn't actually ask any questions in your post. At the end you said "wonder if Lego can send me another sticker sheet" so I was trying to give you advice on how to get one from LEGO. I guess what you really wanted was advice on sticker goo removal. When I removed the sticker residue from my Williams Racer, I soaked all the panels in soapy water until the residue was really soft and then scraped if off with an X-Acto knife. It worked pretty well. I don't think there is any conspiracy. You never know what people are going to be interested in. Sometimes someone will post an amazing MOC and it will get 1000 views but no one will make a comment. Other times someone will make a minor post on an irrelevant topic and it will get 300 replies. The Internet is fickle. Personally, I don't even look at who a question is from before deciding whether or not to reply. Mostly it is based on whether or not I have time to answer. But it's the only relevant thread regarding old sticker sheets.. 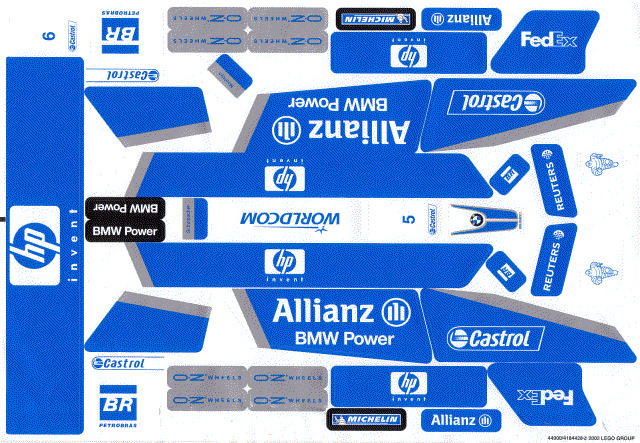 I got a good scan copy of the Williams F1 sticker sheet, just need a good place where to print them. I have actually completed a vector version of the Williams sticker sheet which looks amazing, I have just not found the time to get it professionally printed yet. And then, of course, I will have to cut out the stickers. There are machines that will both print and cut and will make perfectly smooth cuts, but I have not found a place that will do this for only a single sheet. My father owns one of these machines (a vinyl cutter and a large format cutter/printer) for his business. I was thinking about the problem of colour matching the blue. In the end I thought one could leave out the blue altogether, because the model had so much blue on it, and where it was blue leave it transparent by printing onto some of the water slide paper you can buy on FleaBay. I wonder if my dad's machines can also cut on this material... will have to make an enquiry. I have vector software (CorelDraw) and Photoshop here and would be happy to do repros for anyone wanting something specific... if it works. I know he can also print on metallic material so that might be a solution to the issue of reproducing the silver in the F1 Williams set above??? PS... not sure the netiquette of not posting in old topics is very relevant. It helps keep information together so you don't have to search in 20 different places for it. I created the file in Canvas, but I can export as an Adobe Illustrator file. PM me if you want a copy. I did the metallic color by using a gradient and it looks pretty good. At this point, I'd be fairly happy with any respectable looking sticker at all. The blue color matching is an issue, but if you have the printer you could iterate the color in the file until you get something that prints well.